I have a piece of advice for any character in a Nightmare on Elm Street sequel (remakequel? ): if you really need to stay up, like not fall asleep at all, just watch The Haunting and The Woman in Black back to back. Do it alone in the middle of the night and you'll be too terrified to close your eyes, let alone fall asleep. Freddy will just be twiddling his thumbs, waiting impatiently while you seek every shadow for the terrible ghosts waiting to murder you. Nancy had the right idea trying to watch The Evil Dead, but there's something to be said for an atmospheric haunted house movie. Many contenders are out there, and horror fans have their favorites, but for me, Robert Wise's The Haunting edges out The Innocents and The Uninvited. The only one that comes close for the Cap'n is Lady in White, and that has everything to do with the fact that it terrified me as a child. But The Haunting is, for me, the haunted house movie to go to and it's all about atmosphere. 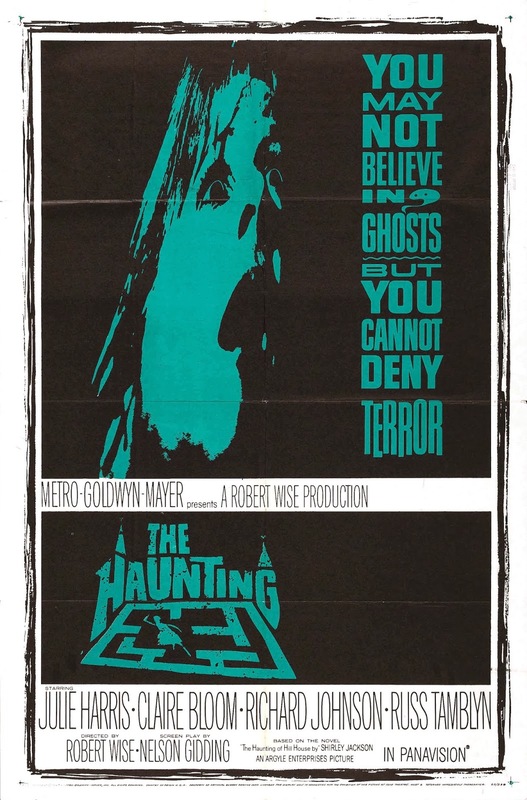 You never see a ghost in The Haunting, and, in fact, the only "effect" on camera is the pulsing door between Nell (Julie Harris), Theo (Claire Bloom), and whatever might be on the other side. Wise relies entirely on sound and the cast does the rest of the work, with Harris handling the brunt of the scares. It's a fair argument as to whether Hill House is actually haunted or if Nell's tenuous grip on reality is feeding off of the creepy vibe. She's not helped in any way by the distant Dr. Markway (Richard Johnson), the emotionally manipulative Theodora, or the pragmatic but otherwise "audience surrogate" Luke (Russ Tamblyn). Is she losing it or do the spirits haunting Hill House really have it in for the most vulnerable member of this research team? The Haunting is a brilliant exercise in audience manipulation, slipping you into Nell's mindset without the benefit of snapping you back to reality. The response from other members seems unwarranted, but we're predisposed to her perspective, so of course something is trying to get her. Only on the other side of the credits is the ambiguity more clear - are they really under attack or feeding off of each other's anticipation for something to happen? Did something really move or were we not paying attention to the background carefully? The imagination is really quite a powerful tool to scare, and you won't find many better of building tension merely by suggestion until things literally go careening off of the road. The Woman in Black is less subtle, and designed with more "jump" scares - although nowhere near the level you'd find in a Paranormal Activity or Haunting in Connecticut - as well as making it pretty clear there IS a ghost and that she has the power to directly impact the world of the living. That said, the second theatrical release from the newly branded Hammer Films (the first was Let Me In) has enough atmosphere to carry it past the mandatory "scares" modern audiences seemingly require. I've already reviewed The Woman in Black here at the Blogorium, and I selected it specifically because it does make you fear the darkness in your own home. Where the Cap'n lives, there's an upstairs "loft" section that overlooks the living room, and I won't pretend I haven't glanced up there while writing this. It's late and there's nobody else here but... you never know. While I'm pretty sure I mentioned this last time (forgive me, it's late... or early, I guess), but I do appreciate that director James Watkins takes a slow approach with the ghost. Instead of lots of "jump" scares, there are long scenes wherein Arthur (Daniel Radcliffe) is sleeping or distracted while in Eel House and the "woman in black" appears and creeps up on him. We can see her, but he can't, and the tension is palpable. It's so much easier to have "nothing, nothing nothing, LOUD NOISE," but until late in the film Watkins resists doing that much with the titular specter. It's much appreciated, and to be honest, that set up / pay-off isn't going to work as well after Sam Raimi took modern horror directors to school with "jump" scares in Drag Me to Hell. Up Next: The Wolf Man and Frankenstein Meets The Wolf Man, and then... John Dies at the End!